Our system of water transport to the livestock is fairly unsophisticated. There are a couple of cold proof spigots on the farm, and a series of hoses link up to them. 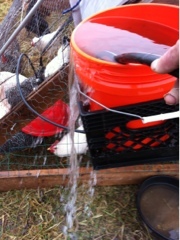 On days when it will freeze and not warm up barrels are filled and dipped with buckets after the skim ice is broken.